Alphacon LLC is a residential commercial home construction remodeling service provider in Hudson, Nashua, Amherst, Hollis, Windham, Bedford and other Southern New Hampshire cities. 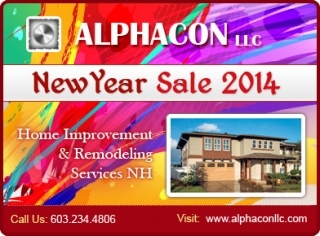 Start New Year with saving of $500 on any new home construction or remodeling services project over $5000 from Alphacon when you contact us for quote in month of January 2014. So hurry offer is valid till January 31, 2014 â€“ please mention this Classified Ad and CODE 500Jan14 to get the discount when getting the quote for home improvement and remodeling project.